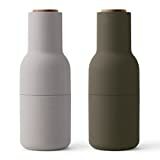 The cool new Joseph Joseph Y-Grinder is an innovative twin-chambered grinder that fuses a salt and pepper mill into one stylish unit. 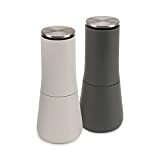 To release salt or pepper, just twist either grinding knob on top. 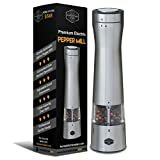 It can easily be adjusted to grind from fine to course grades of all types of seasonings, including rock salt. It features a high-quality, anti-corrosion ceramic grinding mechanism, grinding knobs that are finished with a satin soft-grip surface and large, easy to fill chamber openings. 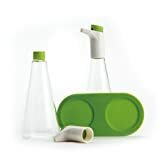 It comes in white, green, gray and is dishwasher safe. Grinding knobs finished with a satin soft-grip surface to make grinding easy. Size: 2.5" x 4.5" x 7.8"